One challenge about shooting The Missing’s two time zones was that we were shooting the present first, so the actors and I had to make sure that their performances were haunted by a past which we hadn’t yet shot. Tony returns to Chalons Du Bois with evidence he hopes will lead him to his missing son. 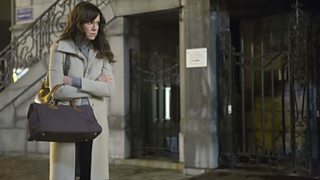 Me, Frances O’Connor and Jimmy Nesbitt were lucky enough to have a few days of rehearsal before the hectic shoot kicked in. I decided that during that period, we would only focus on all the 2006 scenes, that way when we went into shooting the present, we’d really experienced the past. By and large this worked really well, but not always. Like there’s a scene I love in episode one when Tony Hughes, played by Jimmy, and police detective Julien Baptiste meet for the first time (in the present) in a bar in the town we chose to be Chalons. When we shot this, Jimmy and Tcheky Karyo, who plays Julien, had really been enjoying the great bromance of their 2014 story, and it was a little hard for me to convince them that they weren’t really all that friendly in 2006, and that this first meeting in the present should be informed by that. But Jimmy and Tcheky were gents and trusted me on that one. I didn’t get a chance to have a conventional rehearsal period with Tcheky because he came late to the party. He was always our first choice for the part of Julien but, as can happen, it took until the last moment for us to bag him for the role. So on my first Saturday off after a week of shooting, Tcheky came round to my flat and we spent most of the day and night reading all eight episodes. I played all the other roles. 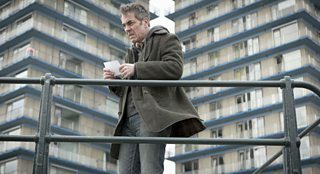 It was one of my favourite moments of prep, working with Tcheky, bringing Detective Julien Baptiste to life. At a certain moment, I put some things out to snack on and Tcheky started eating some pistachios while we were reading a scene. “That’s exactly what you should do in the big hotel scene in episode four with Tony,” I said. Tcheky just looked so natural and at ease, eating those nuts while dishing out some great Julien wisdom. Introducing little bits of business that Tcheky would naturally do just made the character feel grounded and real. These kinds of human details that sprang so naturally from Tcheky’s wonderful, warm, rock 'n' roll spirit (he’s a great musician), became a big part of how Julien developed. In fact, lots of Julien’s clothes are actually Tcheky’s. Sure enough, when we came to shoot Tcheky’s first ever scene, in a hotel bar with Jimmy, he spotted a bowl of oranges on the counter. He took out his knife and started peeling an orange and eating it during the scene. Tcheky looked just as cool as he had in my flat. Although, in the present day Tony and Emily Hughes are living in separate countries and seem to have different relationships to the disappearance of their child, we tried to frame them in a similar way. I didn’t really want the camera to judge them. 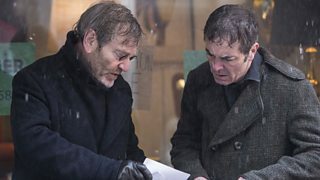 Part of the intrigue of The Missing is that we don’t spoon-feed answers and opinions about characters and their motives. I wanted the visual approach to almost feel neutral at times, leaving it up to the audience to work the characters out. Inevitably, subtly different approaches to shooting the actors crept in. Frances, who plays Emily Hughes, Oliver’s mother, so brilliantly, always looked very compelling and intriguing in profile. Sometimes we would go more extreme and film her behind her head. There’s a great Danish painter called Vilhelm Hammershoi who painted a lot of his subjects from the back. This made me intrigued by the secrets concealed in their hidden faces. Sometimes this approach felt right for Emily’s character. By contrast, I loved shooting Jimmy in big wide shots so we would get a sense of his struggle and the scale of the mystery that has shrouded and obsessed him for so many years. I’m amazed Jimmy didn’t catch pneumonia during the shoot – it seemed like every other day we were chucking rain at him or making him leap into freezing water. He was a true hero though and completely embraced all of Tony’s extremes. I think Jimmy is fantastic in this role – it’s unlike anything I’ve seen him do before. Tom Shankland is the director of The Missing. Read a second post from Tom, all about finding the right location for the drama, next week. 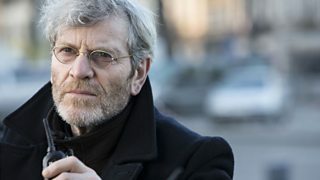 The Missing starts on Tuesday, 28 October at 9pm (10.35pm Scotland) on BBC One and BBC One HD. For further programme times, please see the episode guide.